This dataset contains an archived copy of the fluxnet.ornl.gov website as of September 2017. This archived website is provided for informational purposes only. The last updates to the website and the underlying database were made in October 2016. Support for the Fluxnet project and website was transitioned to http://fluxnet.fluxdata.org in September 2017. Please see http://fluxnet.fluxdata.org/ for information on site locations, data availability, and to add or update a flux tower site. This dataset contains one file, fluxnet-web-site.tar.gz, which is a compressed directory containing html pages from the fluxnet website. Figure 1: The Fluxnet.ornl.gov home page as of September 2017. FLUXNET is a global network of micrometeorological tower sites that use eddy covariance methods to measure the exchanges of carbon dioxide, water vapor, and energy between terrestrial ecosystems and the atmosphere. More than 500 tower sites around the world are operating on a long-term basis. The overarching goal of the FLUXNET data collection at ORNL DAAC is to provide information for validating remote sensing products for net primary productivity (npp), evaporation, and energy absorption. 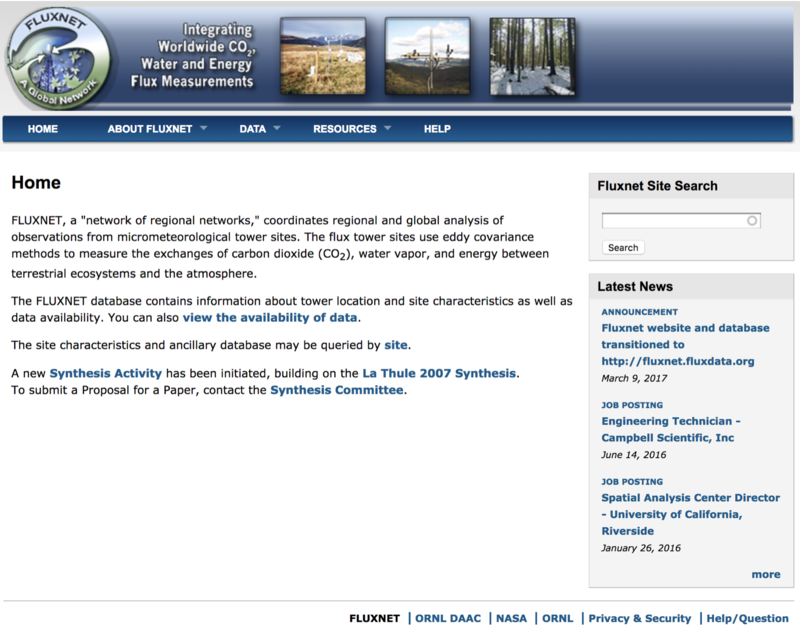 Related Dataset: The following dataset contains an archived copy of the ORNL DAAC's Fluxnet database, including site environmental data, investigator list, maps, images, and a bibliography. Temporal Resolution: Site-level information was collected opportunistically, about once per year. Data File Information: This dataset contains one file, fluxnet-web-site.tar.gz, which is a compressed directory containing a complete copy of all html pages from the fluxnet website. These files may be opened in any web browser. This website content is provided for informational purposes only. Updated information is available from http://fluxnet.fluxdata.org.